Travel industry leaders in Thailand gathered 24 August in Bangkok to honour the 25th anniversary of Khiri Travel. Khiri Travel was founded by Willem Niemeijer in Bangkok in 1993 to arrange travel to Thailand, Laos, Vietnam and Cambodia at a time when the Mekong region was opening to tourists. 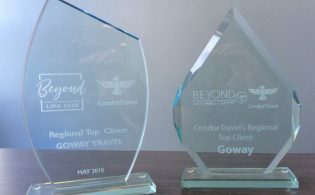 From a one-room office, the start-up has grown into an award-winning responsible tourism destination management company with 230 employees and 17 offices across eight Asian countries. For the anniversary event, Khiri Travel arranged a travel leaders panel discussion entitled, “The Next 25 Years in Travel.” Pacific Asia Travel Association CEO Mario Hardy told the 150 gathered travel industry leaders that the next 25 years would likely see exponential tourism growth, which must be underpinned by better tourism dispersal and more respect for host communities and the natural environment. Randy Durband the CEO of the Global Sustainable Tourism Council told the audience that travel technology will become better and more widely applied to product information and distribution. He called for improvements to destination management. He said governments were only now awaking to the need to manage tourism better and not just apply budget to promotions. 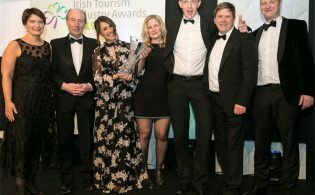 “An increasing number of travellers will also seek less crowded and more ‘authentic’ places to visit – so better traveller dispersion through improved visitor management will be vital,” said Mr Durband. He said it was time for governments to stop defining tourism success by arrival numbers. The Khiri Travel CEO Willem Niemeijer admitted to the audience that it was almost impossible to predict the next quarter century in travel due to the increasing speed of technological change. However, Niemeijer said that tourism dispersion would remain central to Khiri Travel’s product development. “Khiri Travel will continue to support the sustainable development of travel beyond Asia’s hubs.” He added that that values such as integrity, inclusion and respect for local culture would continue to define Khiri’s commitment to responsible travel. “As a CEO, the joy for me is when we work with local people at grass roots to help them realise their hopes for their families and communities. For me, this will not change in the next 25 years,” said Niemeijer. Khiri Travel’s 25th anniversary celebration at the Glass House at Nai Lert Park Heritage Home in Bangkok featured a display of Khiri Travel images and memorabilia from the last 25 years. 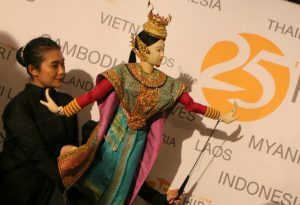 The anniversary event featured a traditional Thai puppetry show. Guests were greeted by Khiri Travel staff dressed in traditional attire from Khiri’s countries of operation: Thailand, Cambodia, Laos, Vietnam, Myanmar, Indonesia, Sri Lanka and the Maldives. “The event was a celebration. 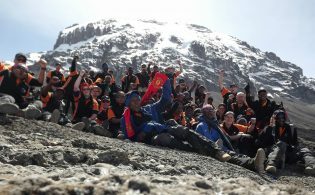 But it also gave guests real food for thought on issues such as corporate social responsibility, overtourism and travel industry challenges ahead,” said Keen. In 2007 Niemeijer launched Khiri Reach, the charitable arm of Khiri Travel. Khiri Reach now supports 25 projects in seven countries. Khiri Travel pays all overheads. One hundred per cent of donations to Khiri Reach go to the projects. Guests to the anniversary event were encouraged to give donations to three projects: help for the victims of the recent Lombok earthquakes, clean water wells in Myanmar, and a children’s foundation in Vietnam. Khiri Travel vowed to match donations received during the event.